I had an unremarkable career in newspapers. Working for mostly small town rags, covering local brouhahas, and occasionally sketching fetching portraits of noble people who lived exemplary lives, I wrote almost nothing likely to be read beyond the leafy confines of the rural neighborhoods I covered. Until later on. Oh, occasionally I’d have a big score that would be picked up by the wire services, or pen some prosaic editorial that people would tape to their refrigerators for awhile, but sooner or later, I’d invariably choose some subject that would rile my publisher, some subject I wasn’t supposed to talk about in public. Like the time a local rich lady hired itinerant migrants to work in her stables, housed them in her barn and paid them peanuts, then had the insensitivity to speak in a derogatory manner about them. Well, I just had to print that, and boy, did my boss hit the roof. She was a friend of his. After many such faux pas as this, I established two cardinal rules that all newspaper reporters should remember: 1, newspapers have the power to really hurt ordinary people, power that should be wielded with meticulous care; and 2, a reporter’s worst enemy is his own publisher, who for financial considerations would eagerly squelch what could be the most important story in the world. So, as I grew older and evolved into different kinds of writing markets, I nevertheless kept an eye on the newspaper business, discovered, back in the days before the Internet, all sorts of alternative journalism levels, and generally observed how the big papers behaved in matters of style and content. The paper I grew up with as a schoolkid in southeastern Massachusetts was The Boston Globe, which had an excellent reputation for truth and quality back then, and still does today, among those who are not conscious enough to realize the evil influence of Jewish ownership that has befallen almost all major newspapers in the United States. It is not your imagination that makes you think most newspapers print exactly what our government tells them to print. In any case, I took notice of the recent news item that the movie “Spotlight” had won the best picture Oscar at the recent Academy Awards ceremony in Hollywood, and that the term Spotlight referred to the Globe Spotlight team, an elite squad of editors and reporters that tackles broad subjects of pressing interest to the public. The subject of the movie was the team’s rigorous investigation of the sexual abuse of children by Catholic priests in the Boston archdiocese and the unwillingness of public officials and newspaper editors to address this matter in a forthright manner for many years. The stories in this series later won a Pulitzer Prize. I had an “uh-oh” movement early on in the film when a new single Jewish editor (played by the Jewish actor Liev Schreiber in a brilliantly understated way) was appointed to lead the predominantly Catholic Globe news staff, and he immediately zeroed on why the Globe had neglected to follow up on stories of sexual abuse of children by Catholic priests dating back 20 years or more. So I immediately suspected this was going to be just another Hollywood Jewish hit piece on its arch enemy the Catholic church. But the story, after all, was true, and both the story and the movie, uncomfortable though they may have been for Boston’s Catholic population, turned out to be riveting, understated and accurate. The outcome of the movie, as well as the result in real life, was that the Catholic cardinal was forced to resign (and hidden in a cushy job at the Vatican) and 239 priests from various parishes in and around Boston were arrested for the repeated sexual abuse of children. The Cardinal had known from the outset, and with the approval of higher-up church officials, had covered it all up. 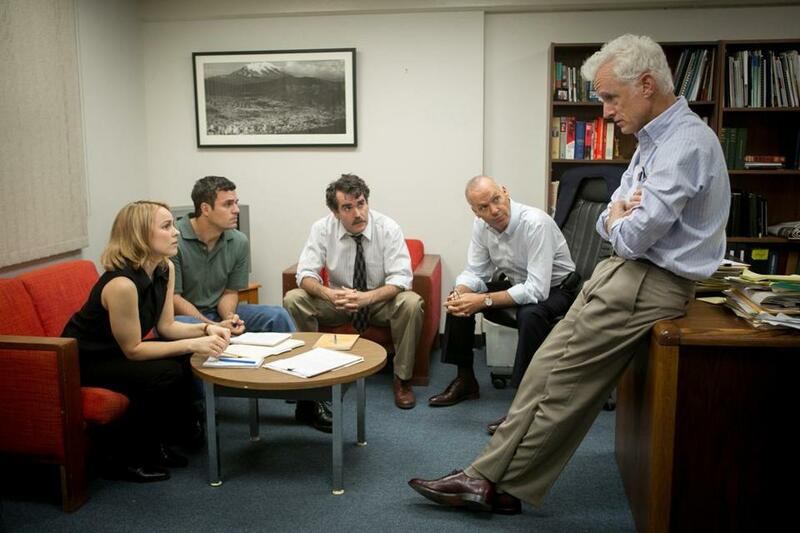 I haven’t seen a movie in a long time that was so well acted (especially by Mark Ruffalo, as the dogged lead reporter, and Michael Keaton, as the Spotlight team editor who was stoically keeping a dark secret), so beautifully photographed (kindling in me fond thoughts of my time in Boston), and tight, purposeful editing. What pleased me most, however, was the way reporters were portrayed as team players who would put everything else aside to pursue the story, running at top speed, working all night, sneaking into offices when necessary, and looking out for each other above and beyond the call of duty to get the job done. This selfless and noble camaraderie reminded me of many experiences of my own past in the business when people eagerly pulled together, ran hard into the night and shared laughter when the job was done, triggering memories I’d forgotten of times that I miss dearly. But that was a long time ago. In more recent years, I’ve been obsessed with Jewish control of mass media, and the way corporate owned newspapers, magazines and TV stations all have conspired with a treasonous government to create an artificial reality that allows our government to kill people in our names, and then lie about the reasons they constantly commit these immoral and unnecesary mass murders. My first real taste of the egregious phoniness of mass media happened in 1990, when an anti-Gulf War rally on Boston Common drew well over 100,000, which the Globe reported as 30,000, and I wrote a story called “Media Whiteout” that described how mainstream media played down antiwar demonstrations (and also played a significant role in destroying the antiwar movement). It was at this point that my stories began to circulate beyond my local area and into the nearby big cities and some national publications. It was then I first began learning that the American population was completely controlled by its mass media. Somewhere around that time I ventured into New York City and visited the offices of FAIR (Fairness and Accuracy in Reporting). There, from Martin Lee and Norman Solomon, I learned more about the manipulation of Americans through media that implanted the ideas of the elite and suppressed the requirements necessary for individual freedom. It was another decade before I learned that FAIR was just another Jewish trick to get people thinking the way our Jewish masters want us to think, hating our own country and playing right into their hands. But by then I had crossed the border from the vague descriptions of our corporate illuminati masters into how the Jewish bankers in London had controlled the United States from its bastion of the City of London since Americans wrote their Constitution. Once I had read the Protocols of Zion and the Leuchter Report (which proves conclusively that the so-called Jewish Holocaust of World War II was and is an absolute hoax), there was no turning back into the left wing lunacy I had once embraced. These were at the front of my mind with 9/11/2001 happened, so I had little trouble identifying the true culprits in short order, and have spent most of my time ever since trying to convince the world of this horrifying fact. As a measure of how newspaper readership has been demolished by the Internet, the Times sold the Globe to billionaire John W. Henry in 2013 for a mere $70 million. Among his many other properties, Henry is principal owner of the Boston Red Sox baseball team. But he now owns the Globe all by himself. Admittedly, I haven’t followed the fortunes of the Globe all that closely, even when I was living in New England, and I haven’t lived there since 1995. But those stories I did see were nothing exceptional. They were typical of most of the mainstream stories you saw in any major newspaper in any American big city, mostly echoing the pronouncements of the artificial reality that this so-called government we have has foisted on us. In 2013 (I don’t know whether it was before or after the sale) I was completely offended by the way the Globe covered the Boston Marathon bombing, totally ignoring the avalanche of evidence that pointed to the events as a false flag operation and repeatedly publishing stories that no trial of the surviving Tsarnaev brother was even necessary. Just throw him jail without a trial, they said. It was appalling, an embarrassment to the Globe and everybody who read it. Unfortunately, everybody in New England swallowed it whole, and applauded police searches of houses and neighborhoods for a patsy they knew did not commit the crimes they accused him of. Bundy family and their friends protested the unfair jailing of the Hammond family over a dispute with the federal Bureau of Land Management. The Oregonian is owned by the descendants of the arch-Jew S. I. Newhouse. The paper never mentioned that the Bundys and their friends were standing up for individual liberty and social justice in the most peaceful of ways. It even defended the premeditated murder of one of the protesters, Robert “Lavoy” Finicum, by a coalition of state and federal officials, in a totally disgusting way that failed to defend the rights of American citizens to Constitutional protections. But recently, there has been one chink in the armor of Jewish oppression, one slight crack in the dam of journalistic tyranny reinforcing government criminality, that indicates maybe the tide is about to turn against this repulsive Jewish totalitarianism as expressed through its parrot media outlets. It occurred, I was surprised to learn, in the Boston Globe, which is no longer under the lockstep control of the Jewish-owned New York Times, but is now owned by the non Jew billionaire John Henry. The Washington DC “lobby” has coordinated the “shameful” and deliberately untrue controlled media reporting on the war in Syria in order to promote ignorance on the issue, the Boston Globe has finally admitted. The newspaper—one of the few outlets in America not owned by a Jewish oligarch—is the first major media to break ranks with the establishment and admit that every report on the Syrian war presented to the American public has been a lie from the very outset. This does not fit with Washington’s narrative. As a result, much of the American press is reporting the opposite of what is actually happening. Americans are being told that the virtuous course in Syria is to fight the Assad regime and its Russian and Iranian partners. Could it be that mainstream media outlets owned by non Jews are more likely to tell the unvarnished truth about what our government is doing than what the run-of-the-mill Jewish owned newspapers are doing to reinforce our foreign-controlled government’s efforts to reduce us all to serfs and eventually take all our property so that we will have no control over our own lives? This is but one small example that this might be the case, perhaps one small spotlight on the cause of the deliberate deterioration and destruction of our formerly sturdy and healthy country, that has now been sucked dry by certain foreign parasites. In our neverending quest for freedom and liberty, we must encourage this kind of honesty from our local newspapers who rarely practice it, and upon failing to get it, cast the charge of criminal censorship upon the Jews who have taken control both of all these media outlets as well as the minds of the American people. If we do not cast off this psychopathological pall of malice and misrepresentation by disingenuous Jews, we will not survive. We need an enormous Spotlight team to investigate and expose how these poisonous parasites are ruining our lives, and expel them in any way possible from the beautiful world we wish to preserve and protect.